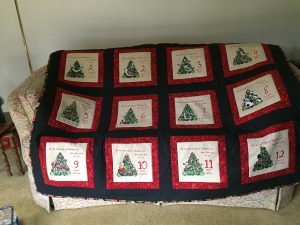 “Attached are pics of my 12 Days of Christmas quilt. 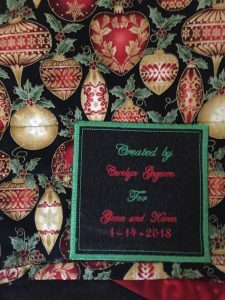 It was suppose to be finished for Christmas but I ran into problems with my embroidery machine threader and it had to go to dealer. Also, I had a problem with the trees being too dense and the thread breaking but with a little patience I was able to complete it. 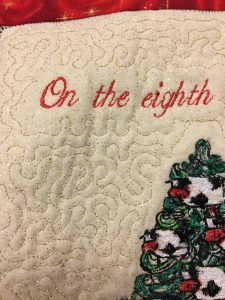 The design blocks were of a gold fleck cotton on which I used my Digitizer program to stipple around the designs in gold metallic thread. 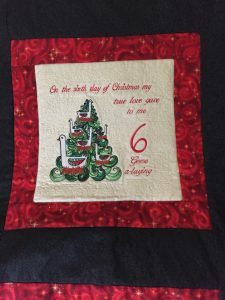 The coordinating backing and red border also have gold metallic in them. NOTE FROM SUZ: The trees are dense and especially on a background of more than one layer of fabric. I recommend just slowing down the machine during the tree areas.